Spend 6 nights in a 2 Bedroom Garden Villa set amongst lush tropical vegetation. These rooms are perfect for 4 adults with an incredible 112sq. metres of space! Avoid the stress of arranging your own travel and let us do it for you! With return economy flights planned for you including 23kg checked luggage, when you travel with My Fiji, the only thing you need to do is pack some clothes and enjoy your holiday! We don’t leave anything to chance at My Fiji. You can disembark your flight knowing that someone is waiting to take your bags and transport you in a private car straight to your accommodation – and vice-versa when it’s time to go home! Enjoy buffet breakfast daily at the spectacular Feast Restaurant. Enjoy views over the beautiful lagoon pool and sample a range of incredible breakfast favourites! Take the family! Up to two kids 12 and under stay for FREE when utilising existing bedding. Those between 4-12 years can also enjoy daily use of the Kids Club! 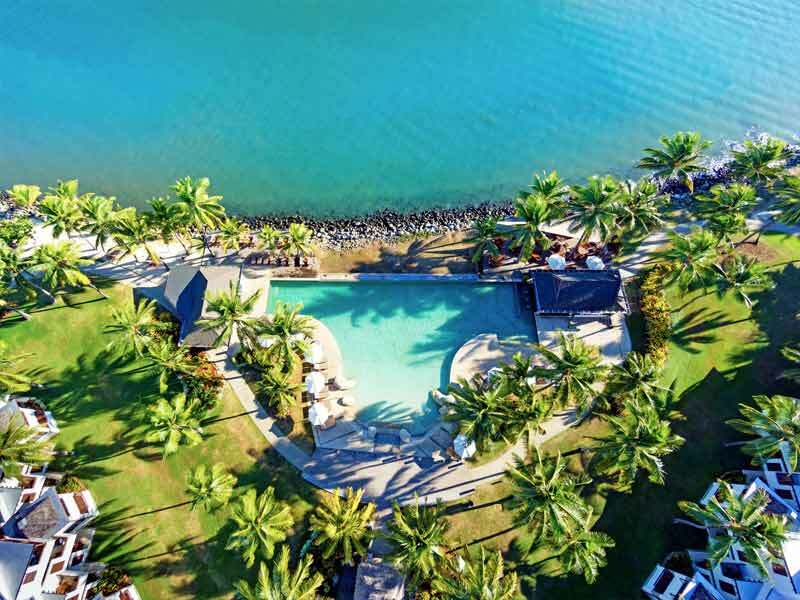 Enjoy Unlimited Golf for 2 adults per room at the championship Denarau Golf & Racquet Club. Play as many rounds as you can fit into your stay for free! 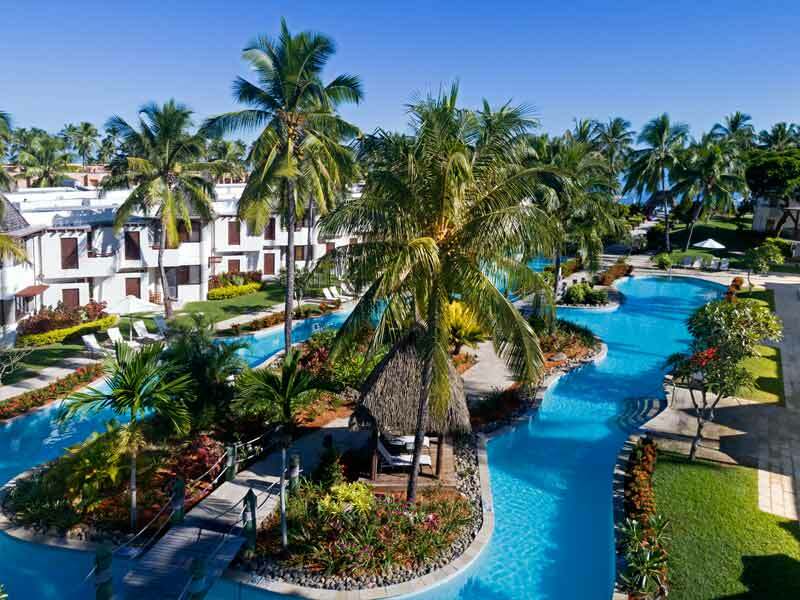 This exclusive My Fiji bonus inclusion is perfect for golf lovers who want to take a swing in paradise. Perfect your skills, play for fun or aim to beat that perfect score! Green fees & shared golf cart are included. Be met at Nadi International Airport with a shell necklace & refreshing drink courtesy of our My Fiji VIP Concierge Services! 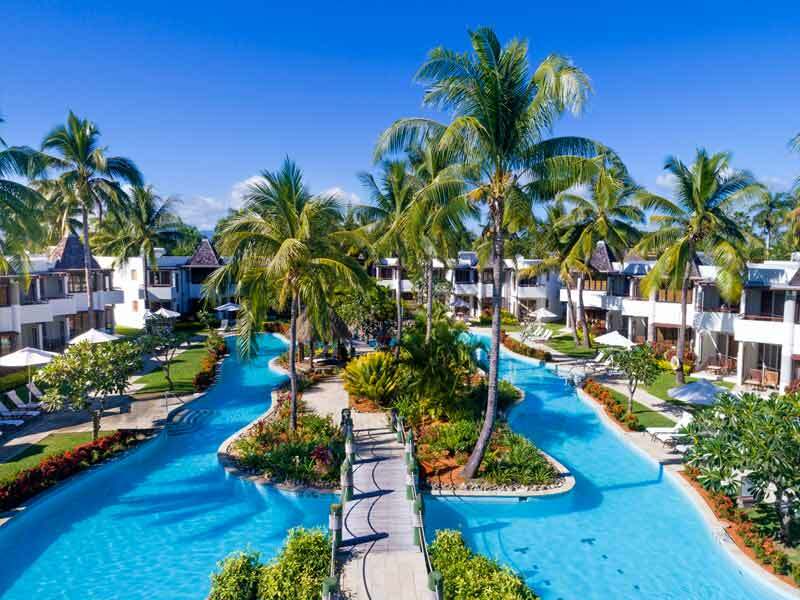 The service includes a My Fiji Beach Bag containing a My Fiji cap (1 per bag), My Fiji beach ball & a Pure Fiji pack (1 per room, per booking), a Tour Vouchers Pack with vouchers for tours & activities, plus special assistance if required. Situated amongst the luscious tropical gardens of the resort you’ll find the 2 Bedroom Garden Villas. Spanning across 112sq. metres of space these villas are ideal for travelling families or groups as they can accommodate up to 6 guests with one king and two double beds. The living and dining areas are separated from the remainder of the villa and are complete with a fully-equipped kitchen and comfortable lounge. The master bedroom features a sofa, TV, private balcony and a ensuite bathroom with bath/shower, vanity area, hair dryer and laundry facilities. Decorated with a tropical colour scheme, light timbers and cane, it’s easy to relax in a 2 Bedroom Garden Villa. 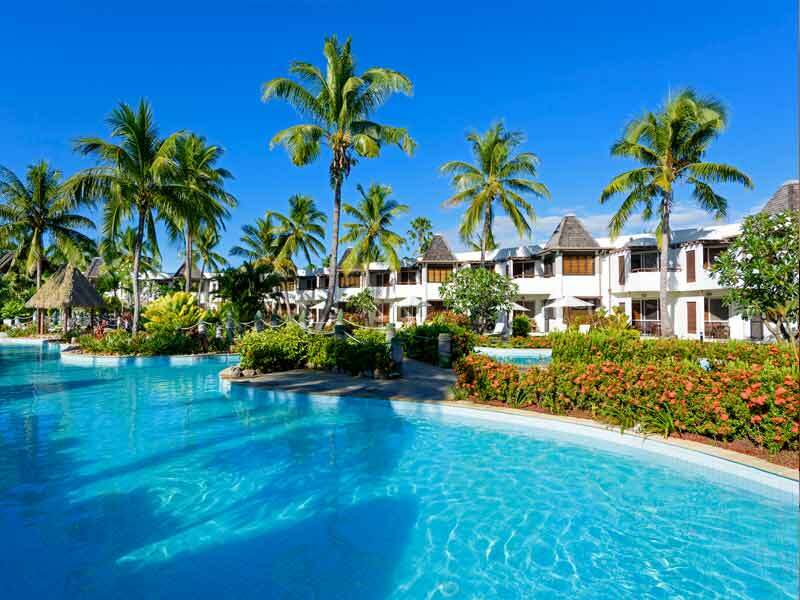 2 Bedroom Lagoon Villa – UPGRADE from only $150 per person! 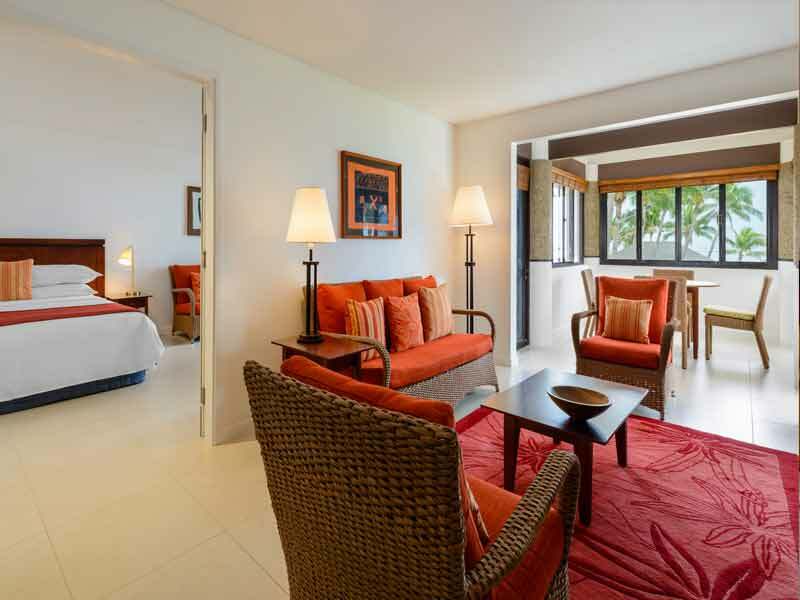 Located on the interior of the resort complex the 2 Bedroom Lagoon Villas are approx. 112 square metres in size and consist of 1 living room and 1 master bedroom and 1 guestroom, positioned on the 1st floor, you can look out over beautifully landscaped gardens and lagoon swimming pool from the patio or balcony. The villas are furnished with light wood, cane and soft colours to reflect the idyllic South Pacific destination. The master bedroom is complete with a king bed, sofa, TV, private balcony and a ensuite bathroom with bath/shower, vanity area, hair dryer and laundry facilities. In the lounge/dining area make use of the fully equipped kitchen and the comfortable lounges while in the bathrooms enjoy bath/showers, vanities, hair dryers and laundry facilities. The multiple bedrooms make for a comfortable stay for up to 6 guests. 2 Bedroom Lagoon Access Villa – UPGRADE from only $300 per person! Take advantage of direct pool access when you stay in a 2 Bedroom Lagoon Villa at Sheraton Denarau Villas. The villas are located on the ground and first floors of the resort and overlook the lagoon pool. You’ll find separate living and dining areas, a comfortable lounge area, master bedroom with ensuite and the additional bedroom with separate bathroom facilities inside the 112sq. metre villas. The villas are furnished with light wood, cane and soft colours to reflect the idyllic South Pacific destination. The master bedroom is complete with a king bed, sofa, TV, private balcony and a ensuite bathroom with bath/shower, vanity area, hair dryer and laundry facilities. In the lounge/dining area make use of the fully equipped kitchen and the comfortable lounges while in the bathrooms enjoy bath/showers, vanities, hair dryers and laundry facilities. The multiple bedrooms make for a comfortable stay for up to 6 guests. 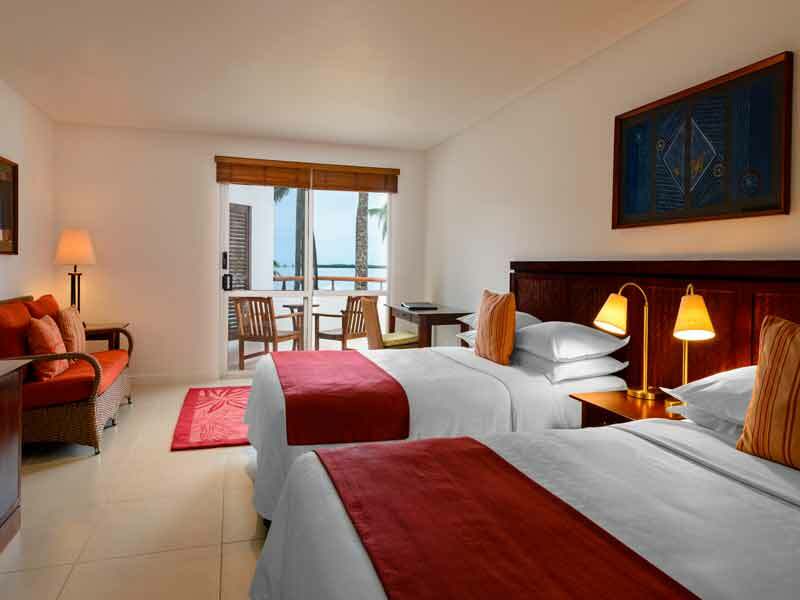 2 Bedroom Seafront Villa – UPGRADE from only $400 per person! Spanning across 112sq. metres these spacious 2 Bedroom Seafront Villas are perfect for travelling families or groups. Featuring a master bedroom with a king-sized bed as well as an additional bedroom with two double beds, these villas can comfortably accommodate up to 6 guests. The master bedroom is complete with an ensuite and private balcony while the second bedroom features separate bathroom amenities and a flat screen TV. Stay connected with Wi-Fi access or make yourself comfortable in the lounge area. Cook up a storm in the fully equipped kitchen or marvel at the views of the ocean, gardens and infinity pool. 3 Bedroom Seafront Villa – UPGRADE from only $700 per person! Situated on the highest floor the building these spacious villas overlook the turquoise waters of the Pacific Ocean and the infinity pool. 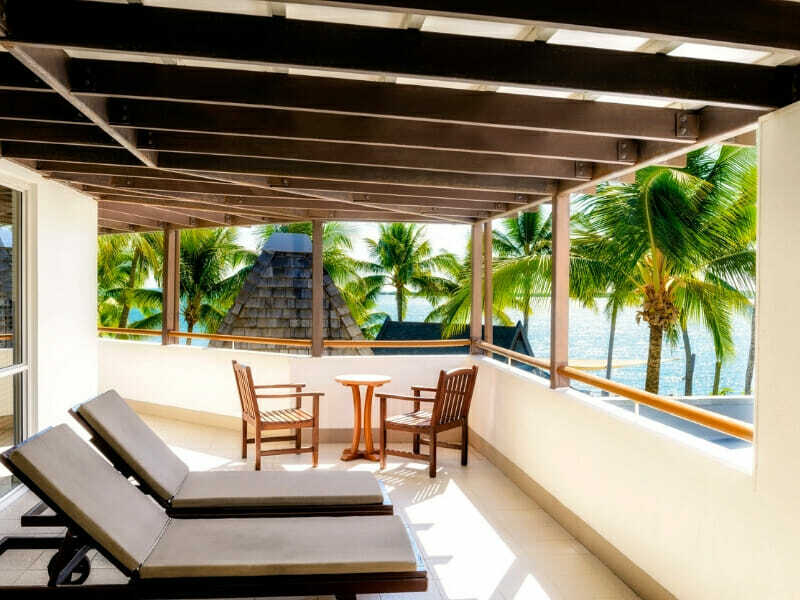 Designed with your comfort in mind the 3 Bedroom Seafront Villas are decorated with calm colours and cane furnishing to represent the island oasis of Fiji. There’s a fully equipped kitchen inside with full sized refrigerator, cook-top, microwave, crockery and cutlery plus a dishwasher to clean up with ease. The master bedroom is complete with all the standard features including a private balcony overlooking the resort and an ensuite bathroom with bath, shower, vanity area, hair dryer and laundry facilities. Spread across the three bedrooms you’ll find two king sized bed and two double beds making for a comfortable stay for up to 8 guests. Take advantage of the rooftop terrace for panoramic views of the resort, the ocean and the surrounding islands. 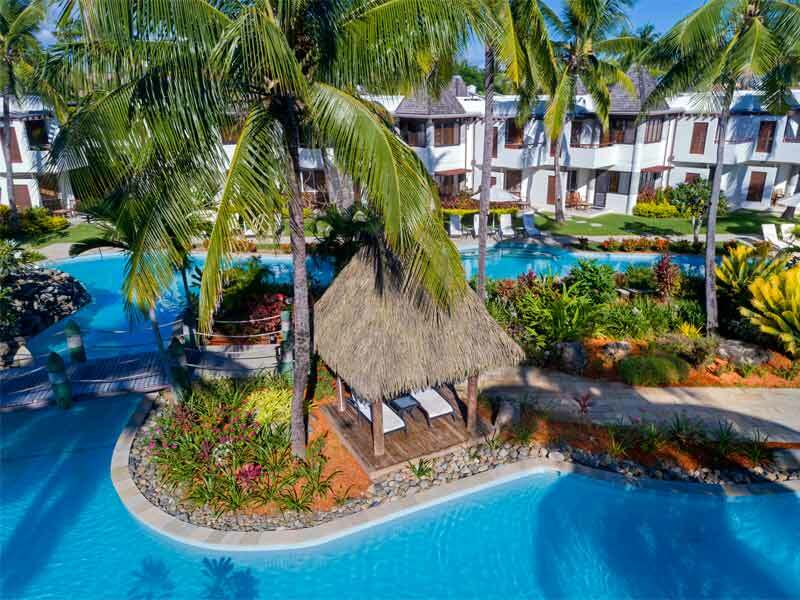 Amazing location, superbly designed villas, world-class hospitality and an extensive array of facilities and activities are just a few reasons why Sheraton Denarau Villas stands out as a premier beachfront resort in Fiji. 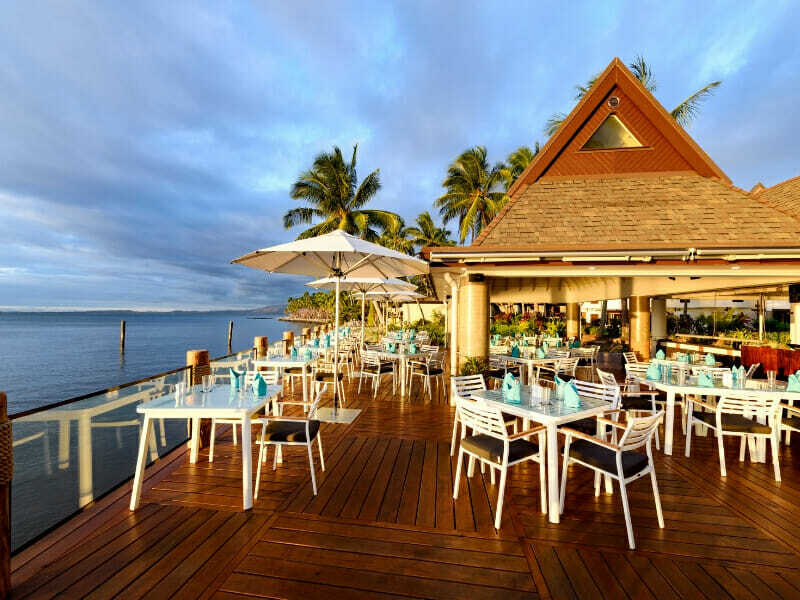 Making up a part of the iconic resort trio on Denarau Island, Sheraton Denarau Villas offer a comfortable and luxurious stay for families, friends and group travellers. 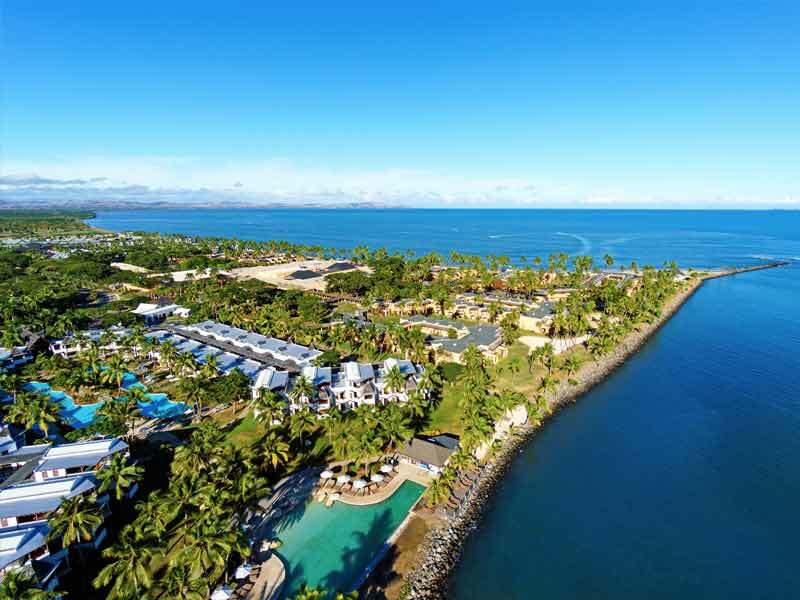 Read more about Sheraton Denarau Villas here! 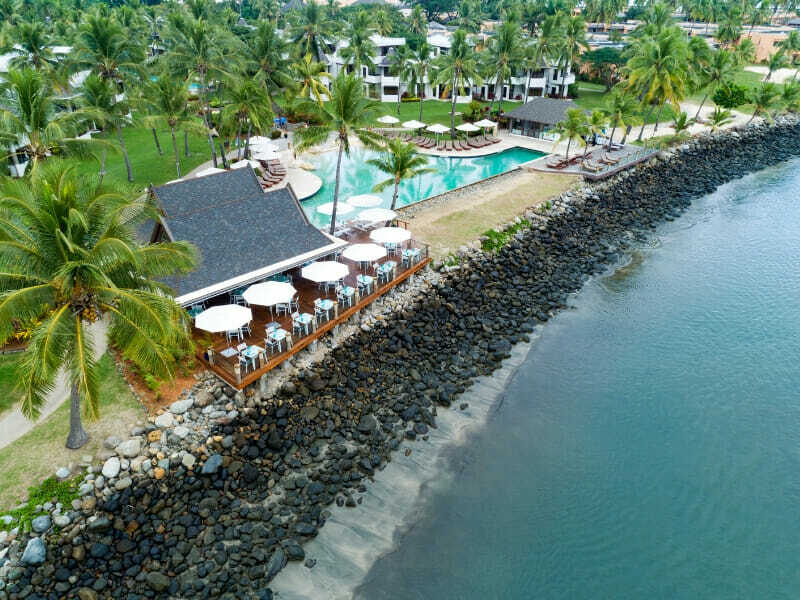 #Kids Stay & Play FREE: Kids Play Free – Children accommodated at Sheraton Denarau Villas are welcome to join the Lai Lai Kids Club day program at Sheraton Fiji Resort on a complimentary basis for the duration of the stay (with full access to a daily activity schedule). This is available for children aged 4 -12 years. Children 3 years and under or children with special needs must be accompanied by a parent or adult. Additionally, a full evening program is available at the cost of F$25.00 per child per evening, except Sundays. Dinner is included in the evening program. *** FJD$1000 credit per room per booking to use at 16 bars, restaurants, Heavenly Spa or room service. The credit cannot be used at resort gift shops, merchandise stores or Adrenalin Sports activity centre. If the resort credit value is exceeded, the additional amount will be payable on checkout. Any unused credit upon checkout cannot be redeemed for cash or held in credit. Wine Dine & Spa credit – the amount provided to the guest on check-in will be credited to the guests account in local currency. 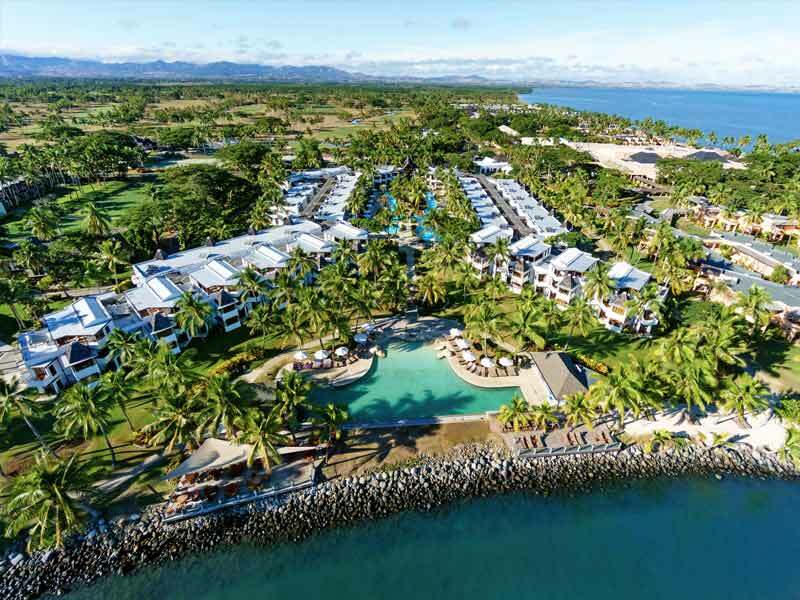 *Unlimited Golf: The offer will entitle the voucher bearer to unlimited golf for 1 or 2 people, at the Denarau Golf and Racquet Club, Denarau Island, Fiji, including a shared golf cart – for the duration of their stay at Sheraton Fiji Resort, Sheraton Denarau Villas, or The Westin Denarau Island Resort & Spa. A minimum 5 night stay must be met. 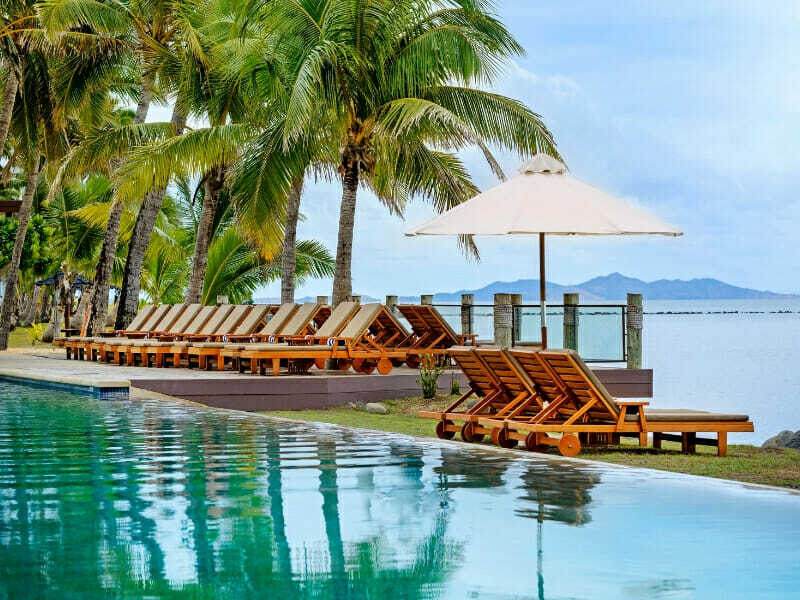 Malamala Beach Club: Sun, sand and private island luxury—discover the world’s first island beach club exclusively with My Fiji! 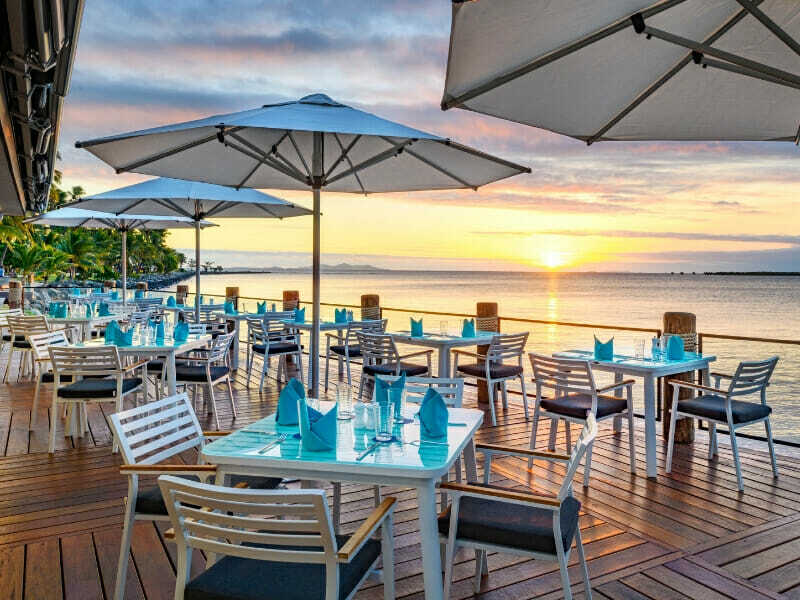 MyFiji Island Experience takes guests on an adventure to the idyllic Tivua Island, a tiny jewel of the Mamanuca Islands, surrounded by white sandy beach and 500 acres of coral gardens pristine reef. Aboard a white-sailed tall ship Ra Marama or Spirit of the Pacific, embark on a 90-minute journey to the picturesque private island, where you will be welcomed by the truly warm Fijian hospitality. There’s nothing quite like the vibrant blue ocean, the majestic white sand beaches and the array of snorkelling sites teeming with coral and diverse marine life. Exclusive MyFiji tour includes Return shared coach transfer to Port Denarau, Afternoon to evening cruise to and around the island, Afternoon tea, kava ceremony and safety briefing enroute, Welcome kit (bottled water and MyFiji Island beach towel for use on the island), Beer, wine and soft drinks whilst on the island, Beach butler service (order taking and drink service at cabanas and the beach), BBQ dinner including fish, chicken, sausages, salads and fruits, Water sports and activities, including guided snorkelling and glass-bottomed boat tours escorted by marine biologist, use of kayaks and SUPs, Guided herbal medicine nature walk, coconut husking and weaving and Lali beating demonstrations, Kids activities in Captain Kid’s Club (90 mins of fun and learning including treasure hunt, sand castle building & sports programme), Music, dancing and cultural presentation and tea/coffee on the return journey, Total of 3 hours on the island. Tours require minimum numbers to operate, whereby tour schedules change, MyFiji reserves the right to offer a similar alternative tour in lieu of original inclusion. Exclusive tour operates on selected days of the week which may change seasonally – enquire for details.